Earlier this year I wrote to the Government of Ontario asking if they will use the powers section 83 of the Criminal Code gives them to legalize amateur combat sports. So far they have replied with silence. 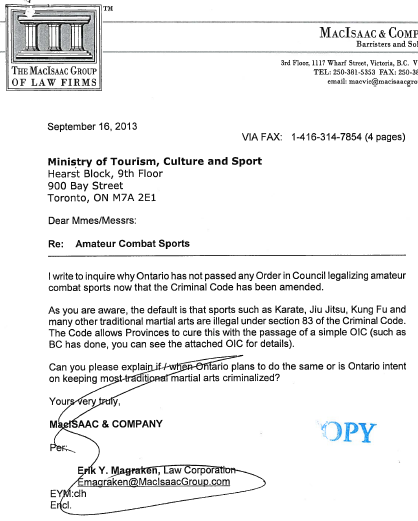 Until the Government acts it is worth noting that not only is amateur MMA technically illegal in Ontario but so are many other traditional martial arts competitions such as Karate and Jiu Jitsu. If you are frustrated with Ontario’s slow response in the face of the overhauled Criminal Code provisions I suggest writing to your local MLA and demand action. I will continue to follow up with the Government until I receive a reply about their intentions. Here is a copy of my Open Letter to the Ontario Government. Feel free to use it as a template to voice your concerns to your local MLA.